Being productive is at the top of nearly every list for entrepreneurs, students, and writers alike; it is the holy grail of success, as it is the turnkey solution to just doing more. There are volumes upon volumes of books available for you to jump on board the latest trend that is touting productivity hacks or how to be a growth junkie; alas, this post, in many ways, shares a frightening number of similarities. There will be jargon galore and, of course, a list. Map out your day. How does a typical workday look to you? Knowing the answer to this simple question can offer structure, which can then turn into the scaffolding for a well-designed day. Break up your day into hour-long segments and figure out what happens when. Getting the lay of the land will allow you flexibility you didn’t known you had. As the saying goes: know the rules, so you can break them. Set deadlines. There is a lot of evidence to support that setting deadlines increases productivity and efficacy. Knowing the finish line and how long you have to reach it gives you the subtle push you need to make the time to get things done. Do you have something that needs to be done by the end of the day? Set a deadline and hold yourself accountable, perhaps even reward yourself with something when you meet that goal. Manage your inbox. The dreaded deluge of morning emails that never quite gets gone through, and then the inevitable carryover that follows you like a specter all week. We have all looked at our emails and thought: where did they all come from? A large percentage of the emails we receive are by no means relevant to our day-to-day operations, which the playing field for improving productivity. All of the subscriptions to blogs and websites, forwarded emails, and benign cold emails clutter this precious communication channel. There are great tools out there that will optimize your email contacts and turn that pile into a pipeline. A simple solution for someone who wants to see less in their box every day: learn to use folders and unsubscribe from newsletters you don’t want. Plan the night before. I know, no one wants to do more work outside of the 9-5 grind; however, making a task list for the following day, even if it is only a few items, sets you up for success the following day. Really, it needn’t be right before you go to bed. It could be in the last few minutes at work. As you take a moment to collect your thoughts and things, jot down some tasks you would like to make sure you finish the following day. See, there are still uses for all those Post-It notes in the supply closet. For the tech savvy, make a note on smart phone and set a reminder for when you usually get to your desk in the morning. Know what you’re doing. It’s important to know why you are working on something. Building on previous items, you can ask yourself if you are working on the items that will lead to completing the items you set out to complete. This is all about have the right items on your to-do list; and if you planned ahead and mapped your day, this should be a breeze. Automate what you can. We all have some tasks that do not exactly rev our engine; these are the things that we would rather hit the snooze button on if we could to have a lazy Sunday morning. Part of mapping out your day and having an accurate to-do list is so that you can automate what can be automated, and save that precious creative energy on tasks worthy of it. Fall in love with reminders. None of us want to be reminded of what we aren’t doing, but checking in with your goals will keep them forefront in your mind. Reminders can come in all shapes and sizes: a co-worker acting as an accountability partner; a Post-It note on your computer screen; a flow chart on your whiteboard; or a push notification on your smartphone. Organization is your friend. Clutter and organized chaos are two entirely different beasts, and are too often confused for one another. One lacks basic organization and another represents productivity despite a mountain of tasks. Organizing what you do is an important step to getting that black belt in productivity ninjitsu. Have a rhyme and reason for why you are working on task, and organize your day in a way that makes sense to reach your goals. Do you have a particular task that you need done by noon? Schedule in small tasks from the moment you start your day to when the task needs to be completed. Focus. This is particularly difficult when you are simply floating from task to task without any real plan. Focusing will be much easier if you simply stopped switching between tasks without completing anything. Buckling down and pushing ahead with one task at a time will make it easier to move through that to-do list; provided, of course, that you made that list (I’m looking at you, serial procrastinator). Avoid digital distraction. Let’s face it, we live in a digital world (and I’m a digital…never mind). Between hungry apps that want all of our attention and the immediciacy of social media and messaging, we are primed to look at our phones and other devices every few seconds. As you can imagine, this is the antithesis is of focus and productivity. You have my permission. If you’re not using the device, turn it off. Manage your time. I left the best for last. Time management (something we excel at it) is at the intersection of productivity and success. Not managing your time effectively are the little goblins that steal time and misplace it such that you always feel like the day got away from you. The best thing you can do is follow everything up until this point and then introspect on what makes you tick. How do you work best? When do you get most excited? Perhaps a noon lunch-hour slows you down for the rest of the day and you are better suited an early brunch and then a brief coffee break to reinvigorate that innovation. A rule of thumb that has returned dividends is to work 45-50 minutes of each hour, focusing on whatever task you have set forth, and then meditate and reflect in the remaining 10-15 minutes to recharge. 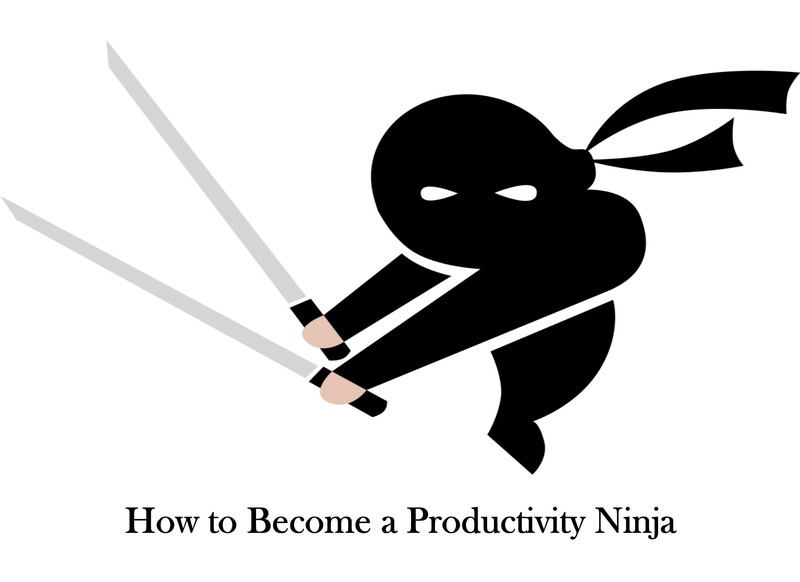 Master these simple behaviors and you will be on your way to being a productivity ninja!